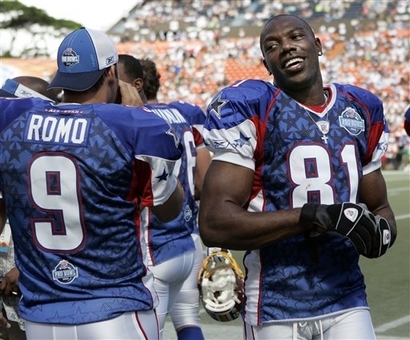 After a shaky start, Tony Romo and Terrell Owens put together some big plays to get the NFC back in the Pro Bowl after falling into a 24-7 hole going into the second quarter of Sunday’s Pro Bowl in Hawaii. Romo found Owens in the back of the endzone for a 6-yard touchdown just after a big fourth down conversion by Romo also to Owens that went for 34-yards to get to the AFC 7-yard line. Owens ended the day with eight receptions for 101 yards and two scores. Romo finished 9-of-16 for 87-yards and two TD’s. In the first half, several Cowboys players made some almost serious gaffs. First there was the tipped pass Romo threw that Antonio Cromartie intercepted, the first of his two during the game. Then after a line drive kick-off following an AFC score, LB DeMarcus Ware attempted to reverse field after catching the kick and fumbled. The AFC recovered and it set up a short Rob Bironas field goal giving the AFC a 17-7 lead early in the game. Flozell Adams was called for at least one false start and even Jason Witten almost mistakenly returned a kick from out of his own endzone before finally taking a knee. 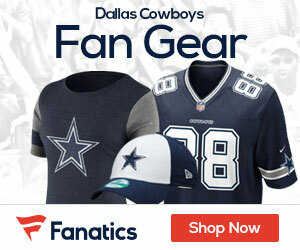 But all of the above players made up for these early mistakes, Romo threw for two touchdowns, DeMarcus Ware made some good defensive plays and Witten had a memorable 35-yard kick-off return after Devin Hester threw the ball back to him from the right sideline. Adams, and most of the Cowboys offensive line played the majority of the game and opened up big holes for game MVP Adrian Peterson, who ran for the second-best yardage in a Pro Bowl en route to the honor. He finished with 129-yards and two scores, the first giving the NFC a 28-27 lead in the third quarter and the second late in the fourth quarter to put the game out of reach for the AFC. Terrell Owens was mentioned as a possible MVP winner after his second TD catch of the game put the NFC up 35-30, but the rookie running back sensation from Minnesota deserved the honor and all the spoils that went with it. Then there’s the fact that Peterson is actually from Texas, so I had no problem with him being named the MVP. The game was very enjoyable and especially gratifying in that the NFC beat the AFC in both the Bowls after being designated the “weaker” conference all season by the press and most sports commentators. Both sides had fun playing the game and there were many trick plays and fourth-down attempts. In fact there was only one actual punt in the game as the NFC faked their first punt to convert for the first down on the way to their first touchdown drive in the first quarter! Of course there were several special rules invoked for the game, such as no blitzing by either side, no bump-and-run coverage allowed inside the six-yard line, and the rule against the nickel and dime defensive secondary. Also of note was the wearing of the number 21 jersey by all of the Washington Redskins players in the game in honor of their fallen comrade, Sean Taylor, who had been voted into the game following his death earlier in the season. Several notable players made big plays on both sides of the ball to make the game exciting for the fans in attendance and watching at home. Devin Hester had two solid kick returns setting up the NFC in good field position, TE Chris Cooley of the Redskins caught a touchdown pass from Seattle’s Matt Hasselbeck late in the first half to cut the AFC lead to 24-21 and FB Lorenzo Neal of San Diego scored his first Pro Bowl TD on a 1-yard plunge. And the lone representative from the NFL Champion New York Giants, DE Osi Umenyora, caused a fumble and put steady pressure on the AFC quarterbacks all day. Overall, it was a very fitting end to the season and certainly a great build-up for the start of the 2008 season later this year.